My husband turned 30 last week! After he planned such an awesome surprise for my 30th, I knew I had to come up with something good for his big 3-0. I conspired with some of our Iowa friends to create some special moments for this special guy, and boy did they help me pull it off! 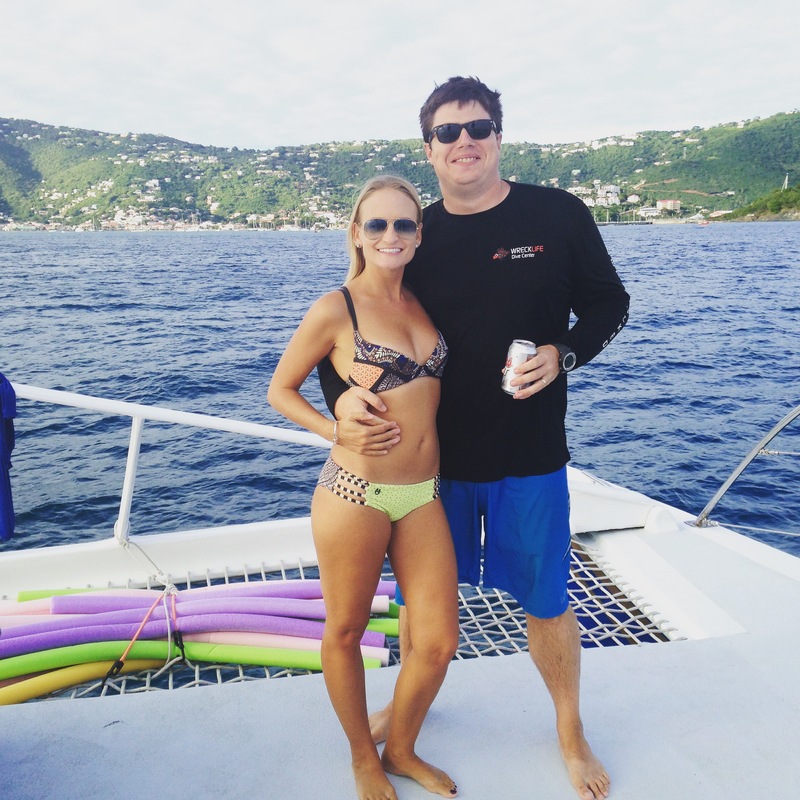 One of Dan’s oldest friends from his Iowa State days, Aaron Valley and his lovely wife Kelsey secretly booked plane tickets to visit St. Thomas. The plan: go out with our island squad to for happy hour, and have me arrive late under the guise of having to cover and teach a last-minute Spin class. I would then use that time to pick up friends at the airport and arrive at happy hour with special guests! Welp, the best laid plans go awry, as they say, and the Valleys were delayed a couple of hours in the San Juan airport. Never one to shy away from a good happy hour, we soldiered on. I slipped away later, and my girls left the husband crew at the table, saying we were going shopping at nearby Yacht Haven Grande. I was scrambling to meet our friends at the airport. Seeing them arrive was such a relief! Seeing the baggage carousel stop with no sign of their luggage brought on another wave of stress. Never fear, island life prepares you for such things. We called the contact number on the remaining bag’s luggage tag, and found out that the Valley’s luggage had been taken by mistake, and would I mind bringing this luggage out to the Red Hook ferry? No problem, it’s not like I have a very important birthday surprise to pull off. I delivered the Valleys to the happy hour, seeing Dan’s truly surprised face (WIN!) and then jumped back in the car to race the ferry clock to get this bag to Red Hook for the baggage exchange. In plenty of time, the nice couple from Ft. Lauderdale had their bag, I had the Valley bag plus the $50 the FL couple gave me (good Karma works! ), and our week of birthday celebrating began. Dan had to work on Friday (ouch), so I gave Valleys the island tour. I also introduced them to Bushwhackers, which was really the most important part. On Saturday, I had a second surprise planned with all our island friends. 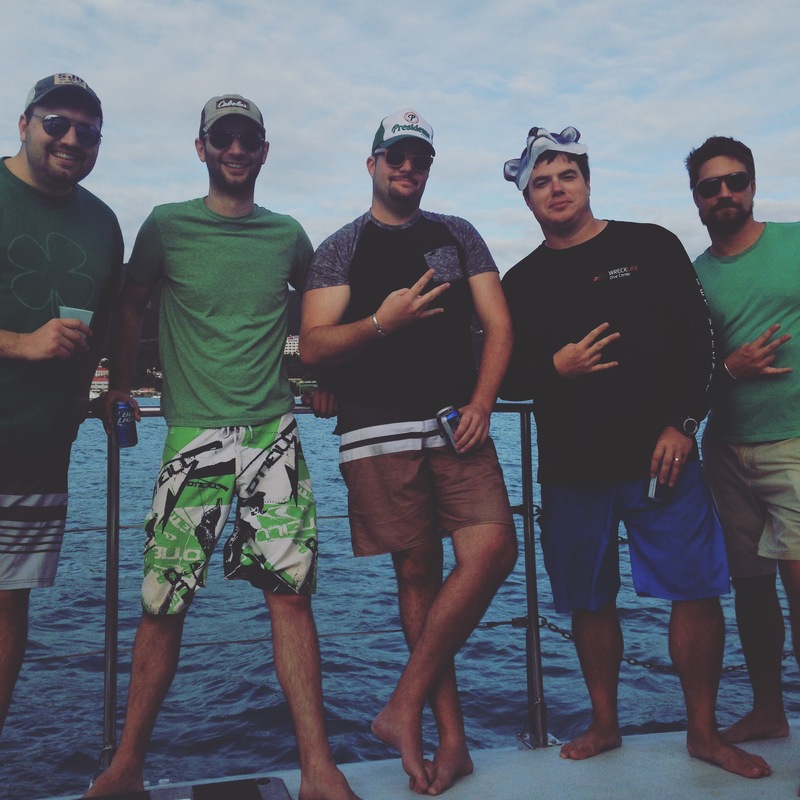 As Reinhardts, Norths and Valleys kept Dan occupied at brunch, I had rented out a catamaran and had friends meet us on the boat to take Dan out for an afternoon of snorkeling with sea turtles at Buck Island. Wearing the “birthday sombrero”, he was super excited to see that everyone was on the boat and waiting to celebrate with him. The trip on Castaway Girl was beautiful, relaxing and fun. Another Iowa State buddy, Rob, and his girlfriend Elyse were in town celebrating Elyse’s 30th, so they joined us on the boat trip and Dan got to relive lots of fun college memories. 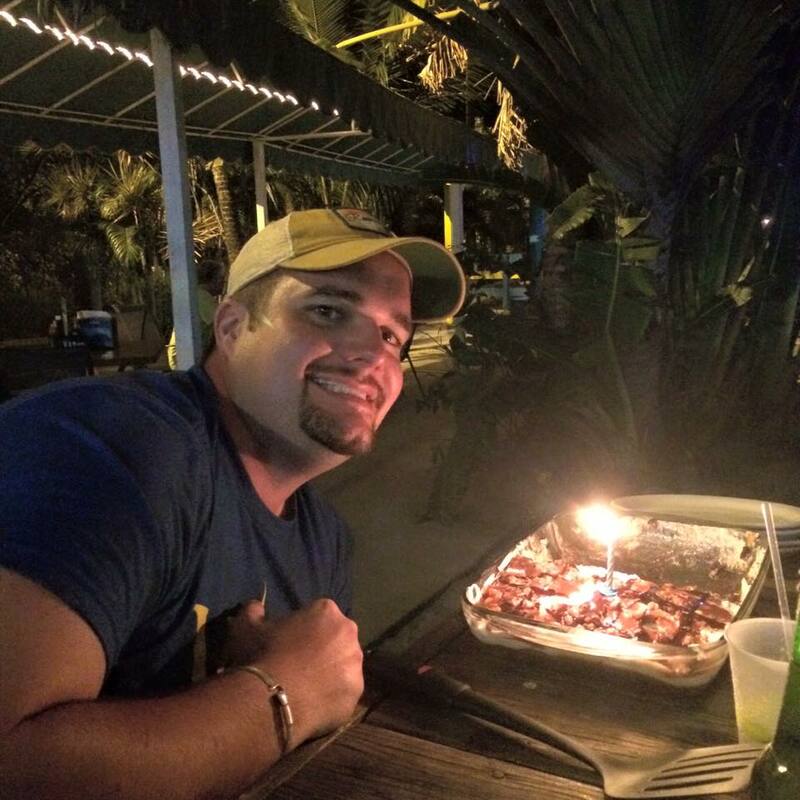 After our boat trip, we grabbed dinner at the Hideaway and then had a bonfire on the beach. 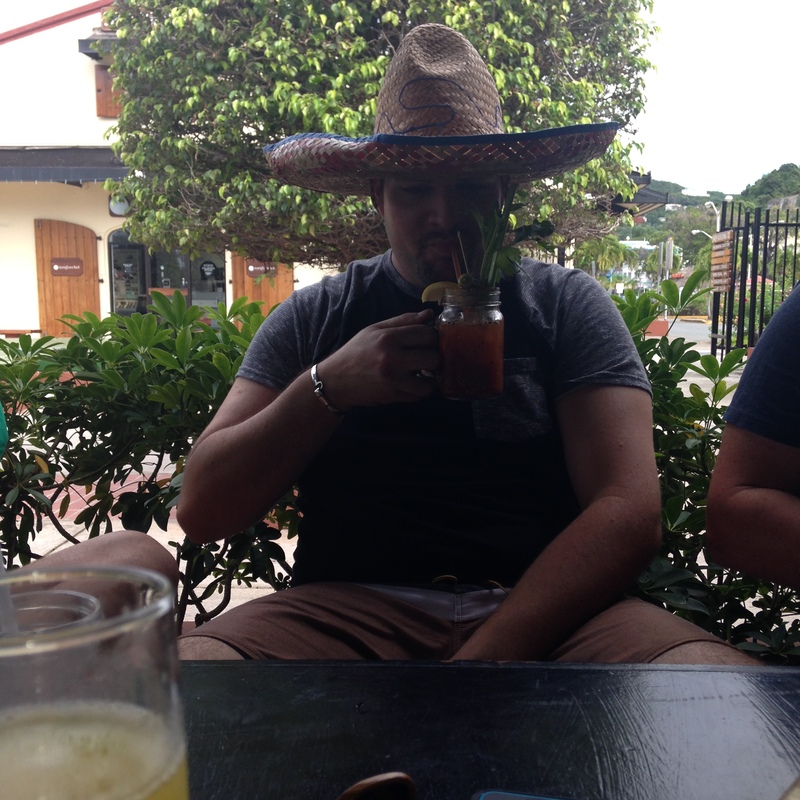 Brunch, bloody marys and the birthday boy. Dan and Valley golfed on Sunday and we relaxed with friends playing cards that night. On the actual big birthday (Monday – which was also an anniversary for the Valleys! 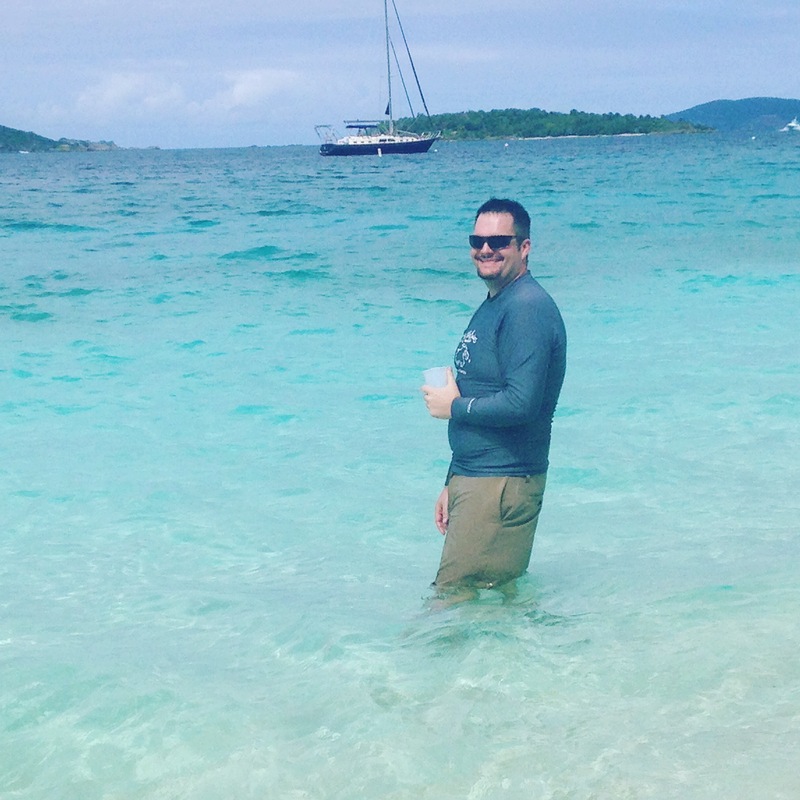 ), we headed to St. John and hiked to Salomon Beach for some sun, sand and relaxation. Ending the day at Joe’s Rum Hut happy hour is never a bad idea, and Hull Bay tacos are a great way to spend a birthday dinner. The view from 30 isn’t so bad. All in all, I think Dan was super surprised and had a great weekend. He pulled me aside and told me it was everything he wanted: spending time with friends, with a day on the water, time on the beach and a relaxed vibe. A *BIG* thank you goes out to Aaron and Kelsey, who helped me pull off a much-needed friend reunion AND spent their anniversary with us. Another thank you goes to Reinhardts and Norths, who helped keep the birthday boy happy and occupied through all my crazy running around. 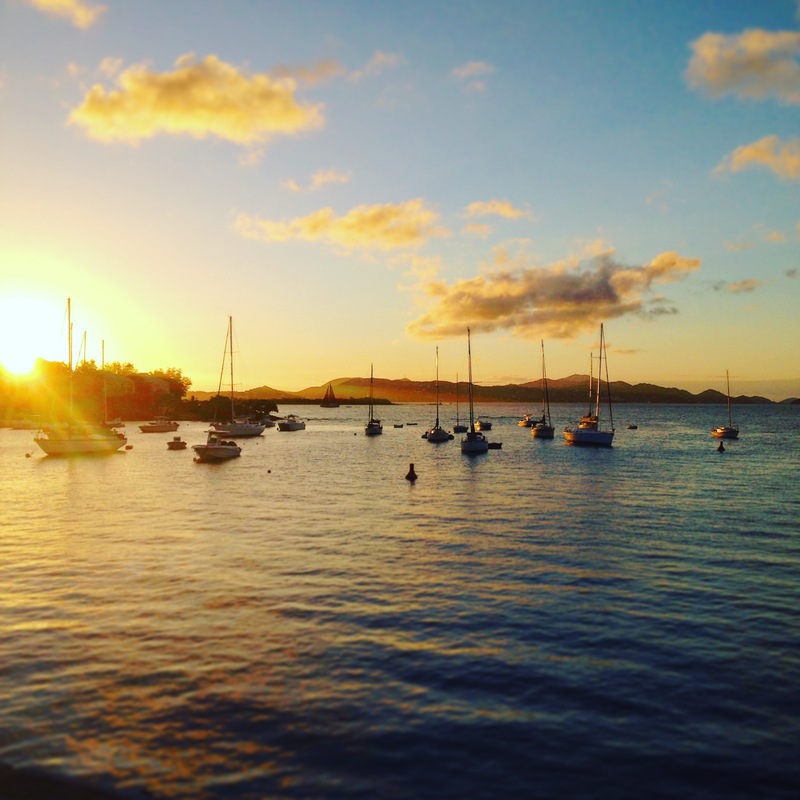 We’re so thankful to have an island family that helps create special memories of our time here. Making this celebratory weekend as sad as it was happy, it was also a goodbye weekend for the Norths. They left island for good and flew back to Dallas on Tuesday after all the festivities. I held it together through the weekend and spent lots of time Instagramming moments of their last days on island. I did NOT hold it together when I dropped them off at the airport, however. 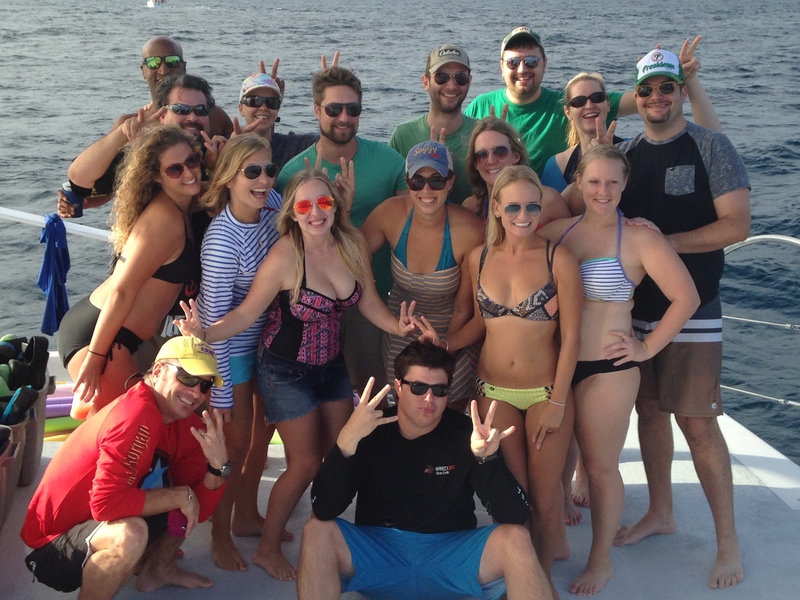 These crazy kids heard our story over a bucket of rum at the Westin two years ago, and joined us on island last year. Lots of laughs, lots of crazy stories and a lifetime of memories were created with these two beautiful souls. We’ll miss you guys! We’ll come to visit in Dallas soon. Once an islander, always an islander! I will miss my Val pal! 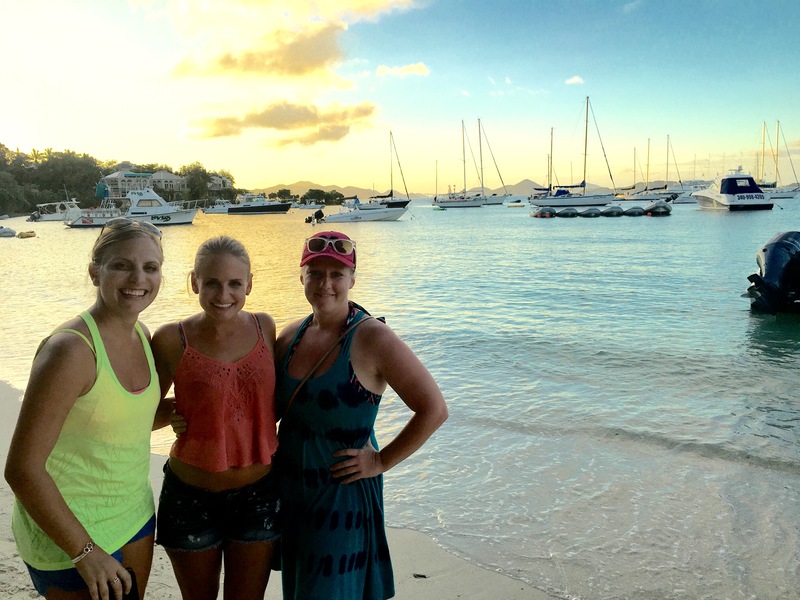 Three blonde musketeers – island sisters through and through. Friends become island family. See you on the other side, Norths! We miss you. 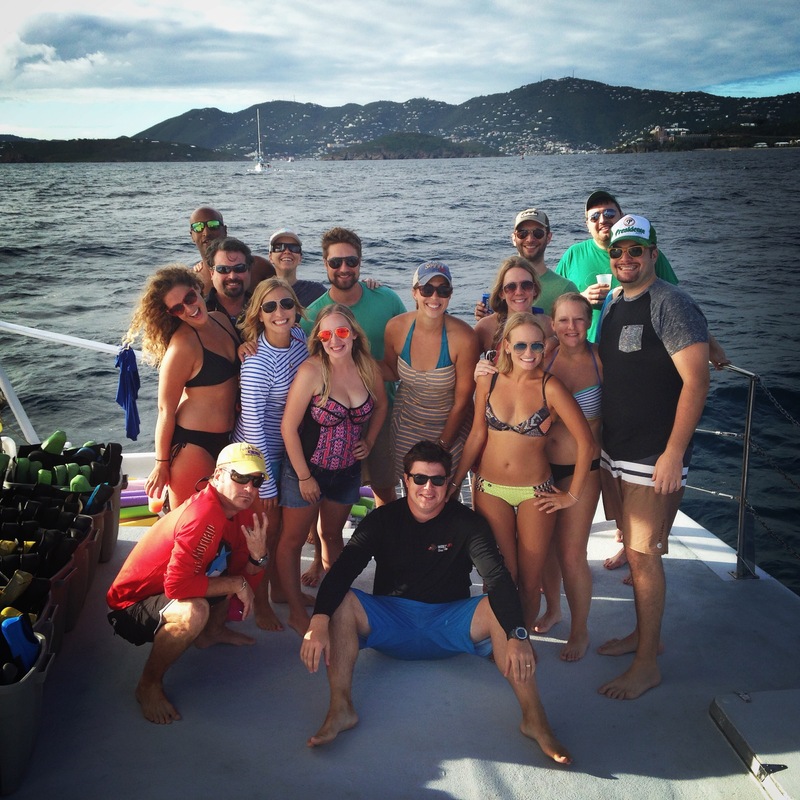 This entry was posted in Friends, Happy Hour, Island Hopping, Island Life and tagged birthday, Castaway Girl, catamaran, friends, happy hour, Iowans, sailing, Salomon Beach, snorkeling, St. John, STJ, STT, visitors. Bookmark the permalink.